We know that having a baby or infant means you can still head off to the four corners of the earth and everything in-between, and you simply only have to bear a few extra things in mind beforehand, such as what you’re going to take and how you’re going to get there. Having children does not mean no travel, having children simply means a little more to think about. If you’re considering heading off on a little adventure of your own, or simply a vacation somewhere different, you need to give some thought to the sleeping arrangements for your little one. We all know that if your baby is happy, then you’re happy, because you a) get a better night’s sleep, b) your baby isn’t going to be grouchy and unsettled, and c) your holiday will be much better as a result of all of these factors. With this in mind, let’s explore your main options for sleeping arrangements on the road. There are many advantages to allowing your baby or infant to sleep in the same bed as you; let’s look at these first. The biggest perk of this sleeping arrangement is that you don’t need to think about transporting any sleeping equipment with you, e.g. a crib, because obviously they are going to be sleeping in the hotel bed with you. On top of this, your baby is probably going to sleep much easier as a result of being by your side, because they won’t be fretting about unfamiliar surroundings, and will sleep soundly because of this. Okay, so now the downsides. We have to talk about safety issues in relation to co-sleeping. There is a risk of injury in this situation, because it is all too easy to roll over in your sleep and accidentally hurt your baby. Because of this risk, you may find that you don’t sleep so well, and you’re going to be tired the next day as a result. This is perhaps the best option in terms of sleeping arrangements on the move. Why? Because your baby is familiar with the crib, you can allow them to sleep in it for a few nights before you go away, and they will feel at home there because of this transitional period. On top of this, you know the crib is safe, because you bought it with the correct safety aspects in mind. The cons? Whilst you can buy streamlined and light-weight travel cribs these days, you still have to transport it from A to B, which may mean extra weight you can’t carry. On top of this, you have the expense of buying the travel crib in the first place. To counteract this however, if you can find a crib which suits your needs and budget, and you travel quite a lot anyway, then this is simply good cost management. A travel crib is obviously what I recommend. You can read our buying guide here to find a great option. 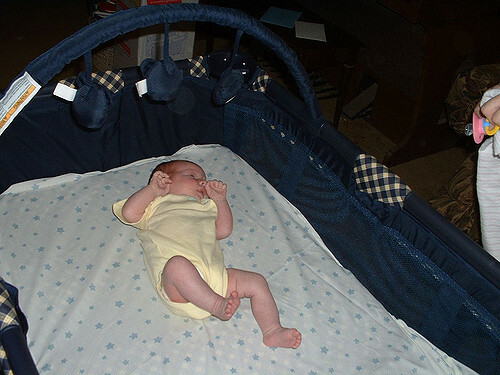 Many hotels and B&Bs these days have cribs on-site which they provide for guests who need them. This is certainly one option to consider when you’re thinking about on the road sleeping arrangements. The advantage of this is that you don’t have to carry anything, just like with co-sleeping, but the downsides are a little more plentiful; firstly, not every hotel or B&B will have a crib, so you may be limited in where you can stay, meaning you can’t be spontaneous, and secondly, you won’t have time to familiarise your baby with the supplied crib, so they may be unsettled as a result. Of course, you could take a roll up crib mattress with you for sleeping, and that means you can take your own equipment, which you have bought with safety in mind, and it rolls up small, with no extra weight really added to your already bulging suitcases. The downside? If you have an active baby, even in their sleeping hours, you may find that you don’t rest so well because you’re worrying about where they’re going to be rolling off to. You also don’t have control over how safe a hotel room is, simply because you’ve never stayed there before. You can find out guide to crib mattresses here. 4 Reasons Why a Travel Crib is a Great Investment!